Imagine the wedding day of your dreams. Beautiful weather, romantic, intimate, and unforgettable. Now imagine your average British summer day. If these two things marry up then great but you can guarantee the weather and intimacy of your wedding if you travel abroad! Somewhere beautiful and romantic, with the sounds of the birds as they swoop by the lake, or the views from the fabulous French chateau; the waves on the beach or the crunching sound of the snow under your feet as you walk along the alpine mountain tops. Your imagination is literally your limit when it comes to destination weddings! Whether it be France, Spain, Italy or Greece, to further afield like the Carribean, Australia, Maldives or South Africa. Mills Films can follow you to make sure that your wedding has been captured in a truly beautiful style and give you visual memories that you can keep forever! We are available throughout the year to travel worldwide to film your dream wedding day. It is important that we get to chat through with you what exactly you want out of your day. We find out what makes you laugh, your personal story, your taste in music, why you picked the location, type of ceremony and of course any unique and individual requests that you may have. Your wedding day is special and personal. Our costs reflect your individuality and prices are bespoke according to your personal requirements. All our packages include a highlights film, and an extended highlights film lasting 20-25 minutes. We know the ceremony and the speeches are personal to you, so we throw in full films of your speeches and ceremony too, edited and colour graded to the same exacting standards we hold ourselves to when making the other films you get. We supply a personalised USB with copies of your finished films on them as standard. Extra copies can also be purchased. Have a gander through our films. If you like what you see, we would love to talk to you about your upcoming destination wedding. Most people have a conventional wedding because, well, it’s conventional. Why not go against the grain by leaving town and spicing up your experience during this special occasion? Heading to a Caribbean island for a week is relatively inexpensive compared to the cost of a traditional wedding. The months and days leading up to your wedding can often be a nail-biting, hair-pulling rollercoaster until the actual day is over. 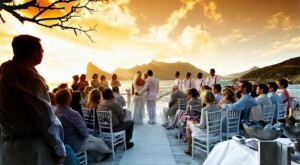 Looking forward to a destination wedding can act as a saving grace amidst the madness. Planning your wedding abroad in a location where you can more or less predict the weather will ensure no rainy mishaps on the big day! If you decide to whisk yourselves away to somewhere like a beach resort area, not only will your getaway be about tying the knot, but it will also be much-needed holiday time to unwind and let yourself be pampered by the generosity of the exotic atmosphere. A destination wedding abroad provides a lifetime of memories, ones you’ll want to tell your grandchildren! By marrying abroad you can pick and choose which lucky individuals in your life get the invite without offending your third cousin you only see every few years. Limiting the number of guests in attendance creates an intimate environment that encourages quality bonding and can sort out the wheat from the chaff when it comes to your guests. If they want to travel all the way there to see you marry, then those friends are worth it! Travelling abroad for your wedding means not having to plan a separate honeymoon, you’ll be on one before you even say I do. It’s no wonder more and more couples are opting for weddings abroad; slipping away from the bustle of everyday life offers you the perfect opportunity to keep the noise out and focus on each other. It goes without saying, where you find romance and unknown surroundings, you will find unpredictable passion. Being somewhere new has a calming effect on people, or maybe its because they can entertain themselves with numerous activities and distractions. Either way, going abroad for your wedding is a great way to take the load off your shoulders and let your guests enjoy themselves on their own. Exchanging vows in an idyllic setting sets a pleasant tone for the beginning of your new life together. Let’s face it: People like to show off what a great time they’re having stunning video and pictures on Facebook (or your preferred social network). Picture-perfect destination weddings produce picture-perfect films. Cool and crazy things happen to you abroad. You’ll return to work with tales that are more than the usual “it was nice.” Friends and family will be delighted to partake in one of the best days of your life, no matter where it takes place. However, if they can be drinking a margarita… poolside… while toasting to your happiness, they’ll be all the merrier. With 332 picture-postcard islands to choose from, even the most demanding bride is certain to find the perfect place in this South Pacific paradise. And if you choose to marry in Fiji on the northernmost of the Mamanuca islands (one of Fiji’s most secluded spots) you can find Tokoriki Island Resort, recently nominated as one of the most romantic hotels in the world, is ideal for a castaway ceremony with plenty of luxury touches. Boasting the romance and mystery of Venice and Rome, and the stunning Amalfi coast, the list of beautiful wedding destinations in Italy just goes on and on. But whatever your dream ceremony, it’s hard to beat saying “I do” at the Lucia Estate – two 18th century villas with views of the Alps reflected in Lake Como. 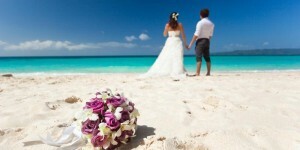 Find out more about a honeymoon or wedding abroad in Italy. Whether you’d love to get married on safari, or to tie the knot in the heart of wine country, a wedding abroad in South Africa is hard to beat. And for a truly once-in-a-lifetime destination, the exclusive Ulusaba (Sir Richard Branson’s private game reserve) is on the border of the Kruger National Park. Follow your big day by trying to spot the big five from this stunning veranda which overlooks a gorgeous African plain. With tiny islands dotting the almost endless coastline, as well as the chance to get married in a hillside castle or historic city, Croatia is something of an undiscovered gem. One of the country’s finest treasures is the stunning old town of Dubrovnik. 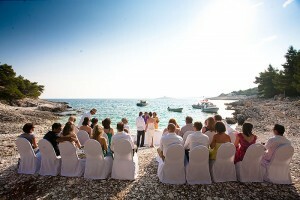 Check in to the Valamar Dubrovnik President Hotel for a waterfront Croatian wedding and gourmet reception. 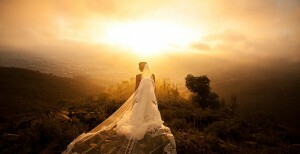 Ever considered Argentina for your wedding? The second largest country in South America has mountain ranges, the wonderful Buenos Aires and the thundering splendour of the Iguassu falls. Eco-lodge Estancia Peuma Hue, where you can take tango lessons and indulge in wine tasting, overlooks a turquoise lake in the Andes with the scenery of Patagonia on the doorstep. Find out more about a wedding in Argentina. Repeatedly voted a favourite overseas wedding destination, Sri Lanka has Indian Ocean views and weather, plus plenty of culture and adventure packed into a relatively small island. With only seven luxurious colonial-style suites at Reef Villa & Spa in the island’s south-west, you’re guaranteed an intimate and private ceremony among the tropical gardens and palm-fringed pavilions if you choose to marry in Sri Lanka. From beautiful mountain scenery to stylish cities, Canada has something for everyone – but Quebec City’s status as a French-speaking World Heritage site really sets it apart as somewhere special. It’s also home to the fairytale Hotel de Glace, a magical setting created from ice and snow every year, complete with its own ice chapel, perfect if you want a unique wedding abroad in Canada. According to legend, Aphrodite, the goddess of love, was born on Cyprus – which is just one reason why it’s so perfect for a wedding. It also boasts stunning scenery, little white-washed churches and almost year-round sun. If you want to get closer to the sea when you get married in Cyprus, Exclusive Yacht Weddings can arrange for you to marry on board one of their luxurious boats before cruising to a nearby bay. There’s a reason Mauritius is one of the most popular wedding destinations in the Indian Ocean – white sand and turquoise sea mean stunning photos are guaranteed. Set on a horseshoe-shaped coral sand cove on the island’s quiet south coast, you can marry on the waterfront or in the tropical gardens at boutique resort Shanti Maurice before enjoying the award-winning spa. 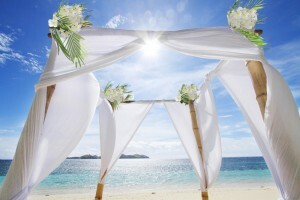 Find out more about a wedding abroad in Mauritius. The land of fire and ice, Iceland’s unique lava landscape, illuminated by the swirling Northern Lights, makes for a unique and stunning wedding. In the country’s south, Hotel Rangá can arrange ceremonies in a traditional Icelandic country church, or outdoors at the nearby Skóarfoss waterfalls for a perfect wedding in Iceland. Then take the plunge (literally) at the Blue Lagoon spa.